Available in DAK .pat files only at this time. Graphs for each of the pillows will be available as soon as possible. 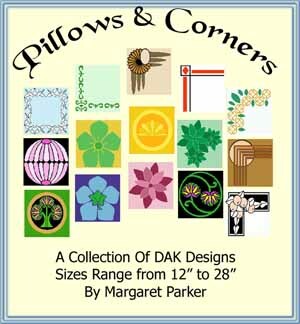 This collection has a wide range of designs and sizes ranging from 12" pillow tops up to 28" floor pillows. You will also receive an 8-page WORD or PDF file which shows a picture of all the designs along with the .pat file name, the dimensions (stitches & rows), gauge, number of colors and description. These designs have all been checked against Double Bed Jacquard in DAK6. Many are suitable for afghans, placemats, table runners, clothing, wall hangings, etc.